Models wearing garments inspired by nature and ancient Greece were front and center Friday at Aura, American River College’s 17th annual fashion show. The fashion show utilized the work of 17 designers in the Collection Design and Production class taught by Diane Grant-Toscano. Bonnie Spencer, the chair of the fashion department, described the process by which the students design their collections. Catherine Zeunges designed the “On the Beach” collection, which was noted by its use of blue and green colors and floral patterns. 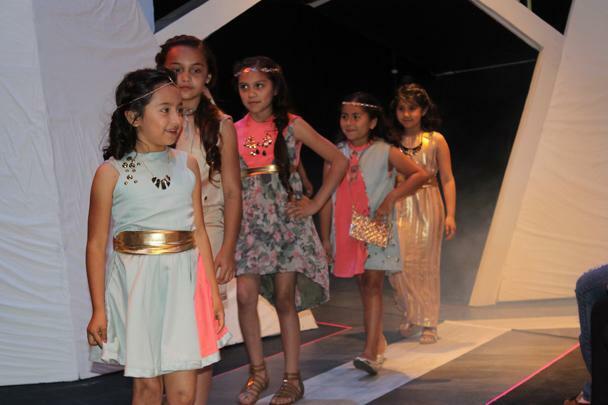 Elena Fuentes designed a collection for children. Show director Brittany Picard described what influenced the dresses. Also inspired by nature is the “Bloom” collection designed by Sarah Flecklin. Dano described the process of making her collection. American River College classified employee Tatyana Torgashev said she came to support Alina Zanko, one of the models. According to Adam Karp, dean of fine and applied arts, the 5:30 p.m. and 7:30 p.m. performances of the fashion show can be streamed online through the Facebook page titled American River College Fashion Program. At the final performance, judges will announce the winners in several categories including Best in Show. 1 Comment on "Students organize annual ARC fashion show"